The West Street community self-build project in Bedminster, Bristol, is a truly unique scheme. Consisting of 14 self-contained two-bedroom flats, they were built by 10 homeless ex-serviceman who are now renting the apartments for themselves. 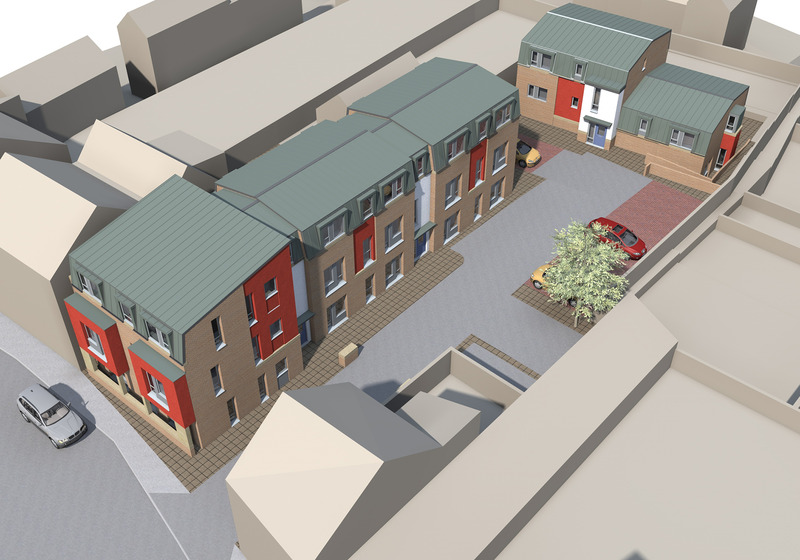 The other four flats have been made available for people with learning disabilities. The project, completed in June 2012, is the UK’s first train and build scheme of its kind – it’s aim was not only to accommodate the participants, but to and provide them with new skills, too. The scheme was set up by Ken Hames (a former Major in the armed forces), The Community Self Build Agency (CSBA) and Knightstone Housing Association. Ken had noticed the growing problem of homeless ex-service personnel and approached the CSBA with the idea of setting up a self-build community scheme for them. He targeted those within the community who were in the greatest need – it’s believed that, at one point, as many as one in four of Bristol’s homeless were ex-forces. Ken, together with the CSBA searched homeless hostels and popular gathering sites in Bristol to find a suitable team to work on the project. They interviewed 90 personnel and narrowed it down to a team of 10. Next, Ken and the CSBA approached Knightstone to help them to find funding and to carry out the construction side of the scheme. A series of team building events and health and safety courses were run for the 10 men while site purchase, planning and grant funding were secured. Training and skills support was provided by On Site Bristol – a not for profit organisation that helps locals to get jobs and training in construction. They partnered with contractor Leadbitter to provide development opportunities to the ex-servicemen for the project’s duration. The project has also helped a number of the ex-servicemen to secure full-time employment. One of the team, Mitch, now has a job as a roofer and is working on developments in and around Bristol. He has also passed his Telescopic Forklift Licence. Another of the ex-servicemen, Mark, who is a trained chef, worked in the kitchen on site preparing breakfasts and lunches for the contractors and builders, at the same time as learning building trades. He is now focusing on setting up his own catering business, thanks to financial and emotional support gained from the project. Size, location and price were the three main criteria for the plot. It needed to be close to good employment opportunities and transport links – West Street proved to be the ideal location. The build began in June 2011 and was plain sailing, apart from a minor issues – they had to do some archaeological digging, which could have set them back financially. However, the Bristol & Region Archaeological Services (the archaeological field unit of Bristol Museum) agreed to allow the self-builders to do some of the digging themselves, which reduced the cost. The project was completed in summer 2012 and was officially opened in July by labourer-turned TV presenter Nick Knowles. There are two blocks consisting of 14 flats that have been built using traditional brick and block. Each has achieved Level 4 of the Code for Sustainable Homes and all are built to Lifetime Home standards. The homes have fantastic features such as PV panels to provide free electricity, an MVHR system to recycle heat and combination condensing boilers in the highest efficiency category possible. In total the project costs £1,939,363 with £660,000 coming from the HCA, £270,000 recycled capital grant funding from Knightstone Housing Association and the remaining £1,009,363 was funded privately. Merchant Venturers, the Army Benevolent Fund and other local charities helped to pay for furniture and computers. The project group are now looking at securing their second site.